US military researchers are developing a method for communication that uses lasers to make sound underwater. The approach focuses laser light to produce bubbles of steam that pop and create tiny, localised explosions. Controlling the rate of these explosions could provide a means of communication or even acoustic imaging. Researchers at the US Naval Research Laboratory say the approach could be used for air-to-submarine or fully underwater communication. 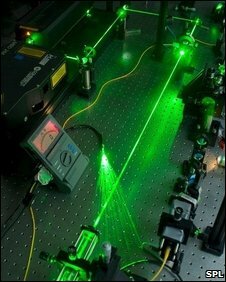 One of the peculiar effects of high-intensity laser beams is that they can actually focus themselves when passing through some materials, like water. As the laser focuses, it rips electrons off water molecules, which then become superheated and create a powerful "pop" - of some 220 decibels. Because different colours of light travel at markedly different speeds underwater, the precise location where different colours focus together could be manipulated by the suitable design of a many-coloured input pulse. Those same focusing effects are significantly reduced in air, so that a laser "signal" could be launched from an airborne source to communicate with submarines, so that they do not need to surface. The idea could also be used for underwater acoustic imaging, by using a moveable mirror to direct the pulses into an array of pops whose echoes can give a detailed picture of underwater terrain.